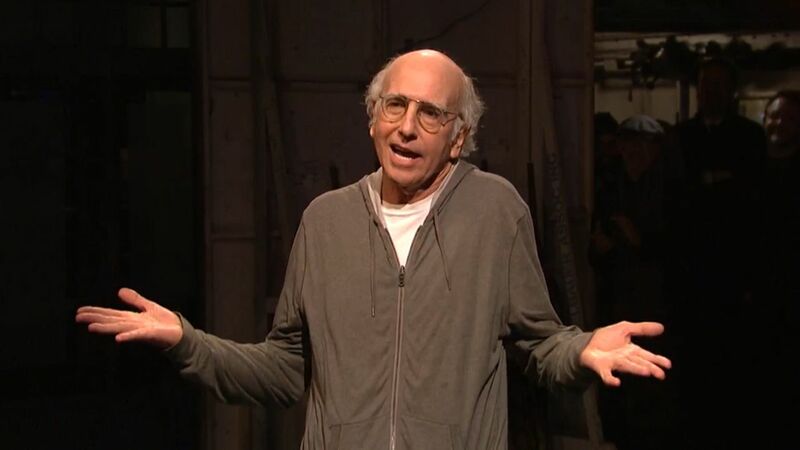 What Can We Learn From Larry David’s SNL Performance? With the title of this space called, “The Wisdom Daily”, I have to admit that I fret that little wisdom can be found in a discourse about Larry David’s appearance on Saturday Night Live this past weekend. And yet, there has to be something to learn from his display and all of the reaction it has engendered. I am a devotee of Larry David’s. I find that his grinding, relentless observations give me a chance to laugh at life in ways that I don’t enough. He gives my wife and me a chance to giggle together throughout the week, simply by reminding each other of the previous week’s episode. And, I am also devoted Jew. I am a rabbi who tries to do what I can to teach a relevant, thriving brand of Jewish spirituality and wisdom. While I don’t believe that the Holocaust should be the sole director of Jewish thought and action, we can’t help but to be influenced by its still daunting shadow. I am privileged enough to be able to spend meaningful time with aging Holocaust survivors in my congregation and their stories imbue me with some of the most significant lessons of my life. As well, since my father was barely first generation American, for someone in my early fifties, I am much closer to the Holocaust than many of my contemporaries. My father lost twenty-four first cousins and he was informed of my Great Grandmother’s death by first-hand account of relatives seeing her head rolling down a Ghetto street. (By the way doesn’t this sound like I am preemptively apologizing for what the rest of what I am about to write?….that in itself is a commentary on how fearful we are to weigh into this conversation without having enough actual blood and skin in the game). Perhaps the wisdom in this discussion; and in a day and age where we find it hard to have difficult discussions without putting our lives on line, is to ask some questions on the matter. I ask questions and admittedly, some are leading and all are laden with apologetics because, frankly I fear that we are less and less able to have complex conversations. I fear that I should label this piece with a flashing “Civility Alert” to beg you to see underneath the layers. I know this seems cut and dry. Everything about the legacy of the Holocaust by way of how we honor the memories and live the lessons is paramount to our beings. And so, on that level, of course it is cut and dry. But the rest of everything, including this debate has some subtlety to it. Just because we wonder and ask the questions doesn’t make us horrible people who have forgotten to Never Forget. It just means that we can hate hate… and still expand our horizons on all levels of thinking. Maybe after all of these years, we have come to find out that Larry David is a self-hating racist. Perhaps, we have come to find out that Larry David was trying to make a more important point and he struck out worse than he ever has before. (Up to you to decide) Perhaps, we are rip-roaring angry because he crossed a sacred line that should never be crossed (I certainly felt nauseous). And perhaps, we should just check ourselves and our anger to make sure we too don’t over-contribute to the cloudiness of a time where it is harder and harder to find wisdom because we are erasing the color of discourse and complexity. Why were so many offended? David crossed a line. Of course, he did. To even joke about such a horrific time in our history is to defile the memory of innocents who died in the name of the worst kind of bigotry and hatred and animalism our world has witnessed. To do so is to diminish the solemnity and honor we must bring to the darkness of that chapter in our history. And yet, is there ever a time to laugh about horror? Does it ever help to assuage our rough contours by bringing laughter to dark matters? There are many accounts of laughter by Holocaust victims and survivors, even about their then current state, which served as an ingredient which lent some hope in order to survive. I didn’t find David’s humor so funny, but I wasn’t offended that he tried to make us laugh at something on its face that there was nothing to laugh about. I have seen others make us see the absurdity through humor as a way of uncovering even more so how absurd and upside down the situation was for the poor victims. Perhaps, humor actually highlights the horror in a manner in which other vehicles cannot. Is there a statute of limitations on when we can laugh again after something horrible has happened? I am not sure and I am only asking. But what do we think? Can we as Jews make fun of the most horrific time in our history without being self-hating Jews? Might we become less self-hating because we are able to make fun of ourselves? I know better than to compare suffering of one people to another. But I have watched other cultures, races and religions poke fun at their own suffering as a way of recounting and internalizing, without trying to offend their own sense of self and history. And, I will admit, I have found myself laughing with them. How about you? Is it possible that David was having a bad night? Perhaps, he was on to something deeper that he hadn’t worked out thoroughly enough about our sense of Jewish shame when horrible things have been done by Jews. I don’t know, but it felt like there was an awkward segue that he attempted to make about the coincidence of the number of Jews who have been accused of harassment, his own uncomfortable relationship with women and thus, the bizarre accusation that desperate, unhealthy men might even be sick enough…. unhinged enough on their journeys that they would even attempt to come on to women who were fighting for their lives in Hell. A predator surely wouldn’t distinguish. Again, I don’t know. I am only asking because for years, some of us who are so offended by David, are the same who have applauded his ability to pick apart the ridiculous in every layer of society, religion, race, gender and orientation. Is he a self-hating Jew who has finally outed himself; or was he trying to brilliantly uncover something horribly uncomfortable and missed badly on the comedic spectrum? What does your deepest sense of wisdom see? I am looking for mine as far and wide and deep as I can. Matthew D. Gewirtz is the Senior Rabbi at Congregation B'nai Jeshurun in Short Hills, New Jersey. He is the author of The Gift of Grief: Finding Peace, Transformation and Renewed Life after Great Sorrow? (Random House). A strong advocate of social justice, Matt Gewirtz is a founding executive committee member of the Newark Coalition for Hope and Peace, an interfaith organization of Jews, Christians and Muslims that is committed to ending gang violence in Newark. Matt Gewirtz strives to find joy and meaning in his daily life and is committed to helping do the same for others. His greatest joy comes from his wife, Lauren and their three beautiful children. AFI Club: Citizen Kane, Can One Word Define A Man’s Life? AFI Club: The Godfather, A Movie About Oppressors Or The Oppressed?